Easy, user-friendly and fun! Our principal aim in designing the PSR-F51 was basic functionality that is both straightforward and user-friendly. As a result, we have developed a keyboard that anyone will find easy to operate and play. Using the intuitive panel, simply select a voice and rhythm to start playing. The PSR-F51's compact and lightweight design packs in a regular size keyboard together with 120 Voices and 114 Rhythms from all over the world. What’s more, this instrument is ideally suited to a wide range of different playing scenarios; not only is the PSR-F51 great for beginners and students, you can also power it with batteries for musical performance on the road. The PSR-F51 is incredibly easy to use with its color-coded, intuitive control panel. Simply select a voice, choose a rhythm and start. It's as simple as 1, 2, 3 ! With 120 Voices & 114 Styles, the PSR-F51 is amazingly versatile. In addition to familiar favouries such as pianos, guitars and brass, the keyboard also features many traditional instruments from all over the world. Dual Voice combines instruments such as piano and strings for a rich and powerful sound. With the combination of 2.5W + 2.5W amplifiers and high-quality Yamaha Voices, you can enjoy powerful and realistic sound when performing in a wide variety of different situations. The built-in metronome allows players to hone their sense of rhythm - vital when performing - while practicing. 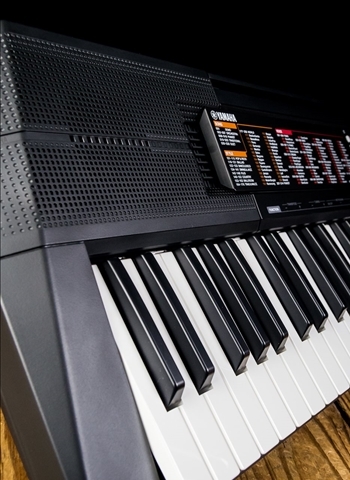 The PSR-F51 also offers a Duo mode that enables two people to play together on identical keyboard sections, which can be very useful when performing live or during lessons. The PSR-F51 can be operated using batteries instead of an AC adaptor. It requires six 1.5-V AA size batteries, which can be either rechargeable (1.2V Ni-MH rechargeable batteries or equivalent) or non-rechargeable. The keyboard comes complete with a music rest for holding sheet music.